Well that year went fast for me, how about you? 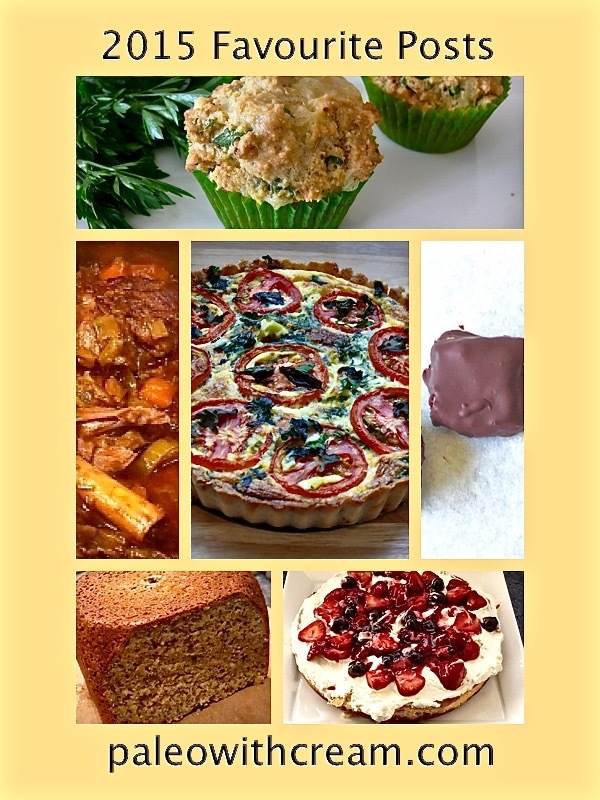 Plenty of recipes up on the blog, some are my own creations and some of others. There were also some that stood the test of time and were favourite posts in 2014. All are pretty tasty though. The image for Slow Cooker Lamb Shanks with Leeks and Balsamic Vinegar has to be the most ugliest picture on the blog. Just take a look at it, bits of meat and the odd bone, looks like a couple of carrots floating around there too. Who knows where the leeks are? Well, who would have thought it but over 900 visitors stopped by to take a look and that was just in one day! And the stand out country was South Africa. You guys just love your meat! Next up were these tasty Savoury Cheese Muffins, created because I did love my cheese scones and have been trying to perfect something as close in taste but with no wheat. Pretty close. OMG – Leek and Tomato Quiche with Oregano Pastry, just has to be my favourite. I first made this in the early 1990’s when low fat food was in full swing. I can count on one hand the number of times I made it since then – just three times. And each time I ate it I was torn between how delicious it was and guilt that I was eating so much fat – because we all knew then that fat made you fat. That is until fat became my friend and my how times have changed. Bread that’s paleo – how can that be? A recipe that my sister in Christchurch sent to me. Paleo Bread-Maker Bread. So easy to throw together and so delicious eaten warm with melty butter! Now here is a family favourite from 2014, Mixed Berry and Coconut Almond Cheesecake. My son is now the king cheese-cake maker. Lucky people who work with him as he shares this tasty bake around. And finally another favourite which has stood the test of time is Chocolate Coconut Squares. Bounty bar like in flavour, very moreish and great to share. So those are your favourites for 2015. What are mine? Well, you know I love the quiche but I also enjoyed these two treats. Orange and Cardamom Cupcakes with Orange Cream Cheese Frosting along with Fudgy Chocolate Raspberry Brownies. What’s in store for 2016? Well, I can tell you more cakes and plenty of sides and salads. That should sort the New Zealand summer cooking out. What about you? Leave a comment if you want something special and let’s see what we can do! All the best for a healthy and happy 2016. Thanks for visiting! Click to follow & receive new recipes by email. Creamy Chicken with Leeks, Mushroom & Sweet Potato. #paleoyum #wholefoods. Hubble bubble, bone broth is brewing. #grassfedbeef, #gardenfresh #organicveggies let's see the results tomorrow. The tenyist, tastiest cucumber sandwich ever. #lowcarbbread #cloudbread with #grassfedwheyprotien and heaps of cream cheese. Follow to get emails of new posts.